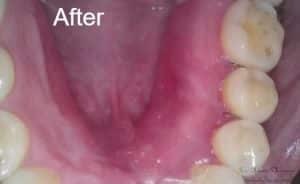 Tori removal is extremely helpful for patients in Gilbert who suffer from these irksome growths in the mouth. 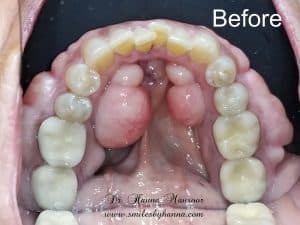 Dr. Hanna Mansoor uses the latest innovations in dental care to make the removal process as swift and painless as possible. Rather than using a scalpel or drill, she relies on WaterLase technology to provide a more comfortable experience for her patients. Dental tori are areas of excess bone in the mouth. 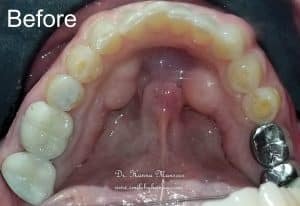 Dental tori that form along the lower jawline are called torus mandibularis, while tori that form on the roof of the mouth are called torus palatinus. 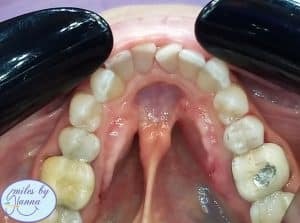 In both cases, these excess growths are typically harmless and don’t cause patients any problems. Sometimes, however, they can cause irritation, which is why many Gilbert area patients come to Dr. Mansoor for assistance. According to statistics, about 12 to 25 percent of adults have torus mandibularis. What’s more, these growths usually come in groups of at least two, which can potentially exacerbate side effects. 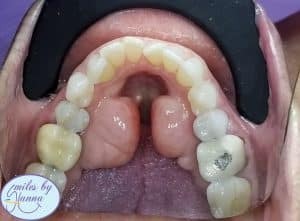 When Should Dental Torus Be Removed? Pain, especially if they are punctured by sharp foods. Swelling, which can cause irritation while eating and drinking. Difficulty speaking if they interfere with movements of the tongue. Problems with the correct fit of dentures or implants. In some cases, patients might notice these symptoms right away as the tori develop. In other cases, patients might have tori for years before symptoms become apparent. Either way, removal is often the best-case scenario. 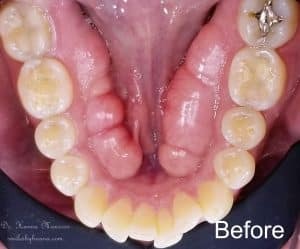 What Is the Tori Removal Procedure Like? If Gilbert patients are suffering from pain and swelling associated with dental tori, Dr. Mansoor can help. In the past, dental tori had to be removed with a chisel or drill, which could be extremely unpleasant for patients. 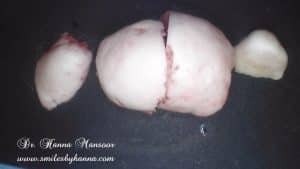 The excess bone would have to be cut out, which would greatly disturb surrounding tissue. 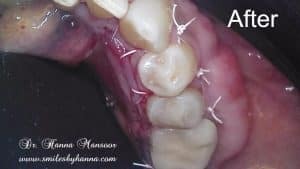 However, Dr. Mansoor no longer uses this archaic method and instead relies on the latest technology to ensure the experience is as simple as possible. In particular, she performs the procedure with the WaterLase tool, which uses a water-energized laser for a pain-free appointment. Because the tool relies on water and light to gently separate tissues in the mouth rather than a dental drill attachment, the patient does not feel any irritating vibrations or heat. This also eliminates the need for extensive anesthesia, allowing patients to remain alert and awake. Some patients may not need anesthesia at all, as all they should feel is a cooling sensation while the tool is in use. Either way, patients can easily drive themselves back to their Gilbert home afterward. Increased precision, which allows Dr. Mansoor to cut away less, so the patient has an easier recovery. Less cross-contamination, which lowers the risk of infection. Less bleeding and swelling, which greatly reduces the amount of pain a patient is in. Little-to-no numbness after the procedure, allowing patients to eat and talk normally. The ability to remove numerous tori in one procedure. How Long Does It Take to Recover From Tori Removal? Patients will immediately benefit from having their tori removed. However, it does take a few weeks for swelling to go away. Typically, the average time for a full recovery is three to four weeks. Most patients find that their pain and bleeding resolve just a few days after the procedure. Like any dental procedure, there is a small risk of infection. However, Dr. Mansoor will provide very specific instructions to help patients keep their mouths clean to avoid this complication. Patients may also need to follow a specific diet as their mouth heals, as well as utilize ice to reduce swelling. 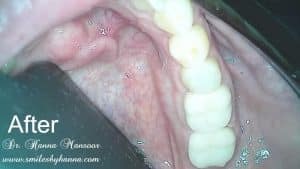 Drinking out of a straw, vigorous rinsing, and pulling the lip or cheek open to look at the area are not recommended, as these can cause the blood clot in the wound to dislodge. Once the dental tori are removed, reoccurrence is very unlikely. However, if the tori were to reoccur, Dr. Mansoor could easily remove them once again with the same procedure. Gilbert, AZ area patients struggling with tori in their mouths should strongly consider the services of Dr. Mansoor. Because she uses the latest and the greatest techniques, patients will have a pain-free tori removal procedure. In just a few minutes, their tori will be gone for good, so they can go back to living life without discomfort. To schedule your initial consultation about tori removal, contact Smiles by Hanna in Gilbert today by calling (480) 279-3700.